I believe you can actually find the solution without taking either leader out and simply exploring the Dust District. There's also a non-lethal option to take out one or both leaders. I need to go back to this and not care about getting a perfect stealth run. Most likely why I stalled and stopped playing. I'm playing Prey now and not caring about stealth at all and it is so much more fun. After reading Clocky's post, I think I need to play Professor Layton games now. They honestly seem right up your alley. But they're only on Nintendo handhelds. Maybe there's a PC equivalent. The nearest equivalent I can think of off the top of my head would have been the two early Telltale "Puzzle Agent" games. ...but i don't remember them being particularly well received at the time. Or maybe I just need to ask Father Christmas for a Nintendo handheld. I really shouldn't though, the Pile is more than I can handle. I really like the Professor Layton games. I'm working my way through the third now. If you knock out Stilton in the past so that he doesn't lose his mind, does Meagan's facial injury go away? I can't remember if she mentions how she got it, but I did notice that it's suddenly gone. Not only that but she's not missing her hand anymore! I can't remember the details, or how many of those details you can actually scrounge up, but the night of or after that seance Meagan was trying to reach Stilton because she was in some sort of desperate situation. I assume that she got some sort of aid to get out of that trouble much more easily. I mentioned this earlier when I first started playing, but I wish that the designers had done a bit more to differentiate Emily from Corvo. There are subtle differences in their capabilities: Emily's Far Reach is like Corvo's Blink, but her range is longer and she's visible (also, you can grab things); Emily's Shadow Walk is like Corvo's Possession, except that you can kill/incapacitate things in that form; Emily's Mesmerize is like Corvo's Time Stop, but it's limited to just 2-4 people at a time. Despite that, I find that I play them in extremely similar ways. Partly that's my own fault for choosing to play that way, but I think it's a weakness in the game's design that I'm so easily able to. Mechanically, Emily feels like a strange middle ground between being a gender-swapped protagonist and being a distinct character. There are subtle differences between the two, but pretty much all the same strategies still work. I don't feel as though playing Emily has forced me to rethink how I approach a situation. I thought at first that Emily wouldn't have access to the crossbow, and that would have made for an interesting switch. Not having sleep darts or silent ranged attacks would have shifted the balance of play a bit. It would have been a start, anyway. Also, blood flies are never, ever fun. Please, Arkane, do not put blood flies or rat swarms in the next Dishonored game. Rat swarms were fine I thought in the first Dishonored—new game, novel dynamic obstacle—but I got tired of blood flies real fast. I think the main thing about playing as Emily is you take the mind set of how you will reclaim your throne. Are you a merciful leader in your choices or going to reclaim with an iron fist. But yeah not too much to differentiate all in all unless you dive into all of that. I finished last night. I loved some of the clever, almost gimmicky level designs (the Clockwork Mansion, and Stilton's mansion) while finding some of the others to be less inspired. Honestly, it felt like a sequel to Dishonored in the same way that a second slice from the same pizza is a sequel to the first. It's very much more of the same with a slightly different mix of toppings. 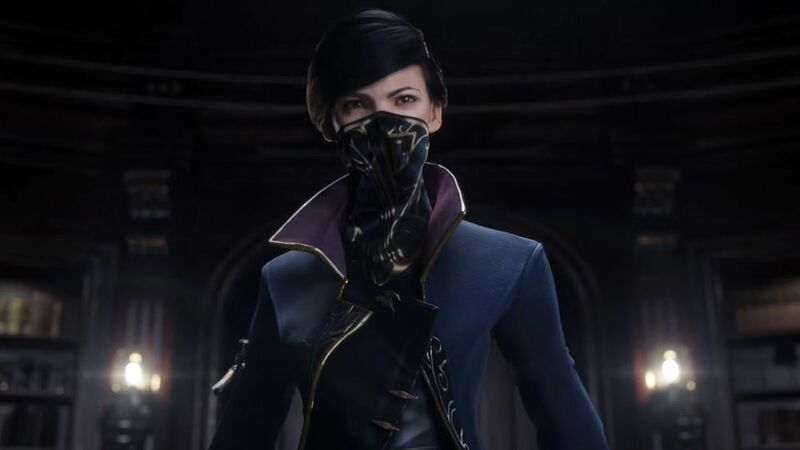 I'd be hard-pressed to find a difference in quality between the two games, although I enjoyed Emily's story in the second game more than Corvo's story in the first (despite some reservations). In the end, this game reminded me of a complaint I heard years ago about Scribblenauts. That game's gimmick was that you could summon almost anything into the game to help you solve its puzzles, but a lot of players ended up summoning the same things over and over again, using old solutions to new puzzles. I felt like I ended up doing a lot of that in Dishonored 2 as a player (as I mentioned a few posts back), but I also felt like Arkhane ended up doing that as designers. The paths into and out of places felt remarkably similar, as did most of the non-lethal solutions. I hope that if there's a Dishonored 3 (and I hope there is; I'd love to play it) that they take some time to rethink some of the basic sets of problems and solutions they present to the player. If you're going to leave that is about the best reason. Hopefully the magic is in the studio of what he brought to all these games. Errant Signal ruminates on 0451, its origin and multiple meanings. I guess someone should have mentioned this for the record? Expandalonequel Death of the Outsider, starring Meagan Foster and Daud, Sept 15, US$30. Unfortunately it isn't telling me much other than "it's a Dishonored game," but that's good enough for me. Finally came back to this and finished my first playthrough, Emily / low chaos. Absolutely loved exploring everything and taking the long way round (and round). I don't do multiple choice very well in these games - If there's three different ways to get past a particular barrier, I'll find the key, and knock out the guards, and disable the security, and eventually stroll through when there's nothing else left to do. I collected most of the runes and bone charms but didn't put a lot of effort into actually using them, I don't even know how many runes I had left over at the end. Far reach or blink is really the only "must have" power. The coins though - no matter how hard I search, I find maybe half of them in each level. Buy new Xbox game. Game consistently crashes to title screen once every time I start to play. Look I hate to be the guy who is always complaining about games but....with a few exceptions this happens with every new game I buy. Am I just unlucky? Are they all on your Xbox? I'd look into replacing your console, if so. Whenever I've looked these problems up online they are known issues. In this case it appears to be caused by save corruption possible caused by an update. Its not game breaking as such. The game consistently crashes only once after about ten minutes each time I start a new gaming session. Any pick up Death of the Outsider? I did. It's next in my queue once I finish up AC Origins. Really looking forward to it. yes. It's pretty great! My only real complaints are I wasn't too fond of Billie's ability set all that much, and I don't like a late game enemy type added in near the end which I found really frustrating to sneak around, since they have some nasty insta-kill attacks and seem a bit unpredictable as to when they can and can't see you. But otherwise it's a solid chunk of more Dishonored. The areas in each mission seemed more hub-based than they were in D1 or 2, and there are far less of them than in the two combined DLC packs for D1. You revisit the same areas quite a lot, but I spent a lot of time in each of them on different little side missions that you can pick up, so you definitely get your moneys worth I think. As the name suggests, it also very neatly ties up the outstanding plot threads with the Outsider, Daud and Billie in a reasonably satisfying way. And WITHOUT a stupid boss battle, which is always a pleasant discovery. Yeah, I enjoyed it as well! I think my major complaint was that the bone charms you found were random. They'd be in the same spot, but which you got weren't set in stone; this can make the game much easier or make certain builds less likely (since Billie has all of her powers, this is really where any customization comes in). I found the lack of the chaos rating meant that while I still went for not being seeing, given Billie's history, I was okay with killing people (I've tended to like the challenge of a no-kill run; with this series, also seeing how brutal the non-deadly option is). It's worth it for the Outsider slash fic in Jindal's vault alone. The bank heist is probably my favorite mission in all of Dishonored. Stuff like that should be on the box. "This game features no stupid end boss battle" would immediately raise my interest for most games. Really liked Dishonored 2. Will surely pick this one up at some point.